What this means for central bank policy, and the INR? Conventional wisdom falls apart when an economy with many difficulties – persistently high inflation, lingering adverse effects of twin shocks of cash bans and consumption tax, widening twin-deficits (trade and fiscal), ongoing banking troubles and a battered currency – grows at such an astounding pace. Contrary to the consensus of a slowdown, India’s GDP growth accelerated to 8.2% year-on-year in 1QFY19 from 7.7% in the previous quarter. This is the fastest rate in more than two years and probably the fastest rate in the world currently. The outcome was far better than the consensus centred on a 7.6% figure, and our 7.0% estimate. Private consumption was the main driver with an improved contribution of 4.7 percentage points of total GDP growth (up from 3.7ppt in the previous quarter, see figure below). This is the highest contribution since 4QFY17 when de-monetisation hit consumers hard and was at odds with persistently high inflation and complicated consumption tax reforms. The firmer private consumption more than offset the slowdown in government consumption and fixed capital formation. Net exports remained a drag on GDP growth for the fifth straight quarter, though smaller than before. On the industry side, manufacturing powered the GDP. On the statistical factors, we can give some credit to the low base-year effect in boosting the year-on-year growth; the late-2016 de-monetisation depressed GDP growth to a four-year low of 5.6% in the year-ago quarter. However, the high base-year effect will be at work to depress GDP growth in the remainder of the year. We forecast full-year FY19 growth of 7.2%, below the central bank’s (RBI) 7.4% and the government’s 7.5% forecasts. Also released at the same time as GDP data late Friday, the government budget deficit widened to INR1.1tr in July from INR835bn in the previous month. The highest July deficit on record, up 76% from the same month last year, took the cumulative deficit in the first four months of the fiscal year to 87% of the full-year budget target. The derailed fiscal consolidation last year is unlikely to be back on track this year, justifying the warning by rating agencies of another overshoot of the deficit above the 3.3% of GDP target. And there are more reasons to expect this as looming elections will move the ruling administration to spend more. 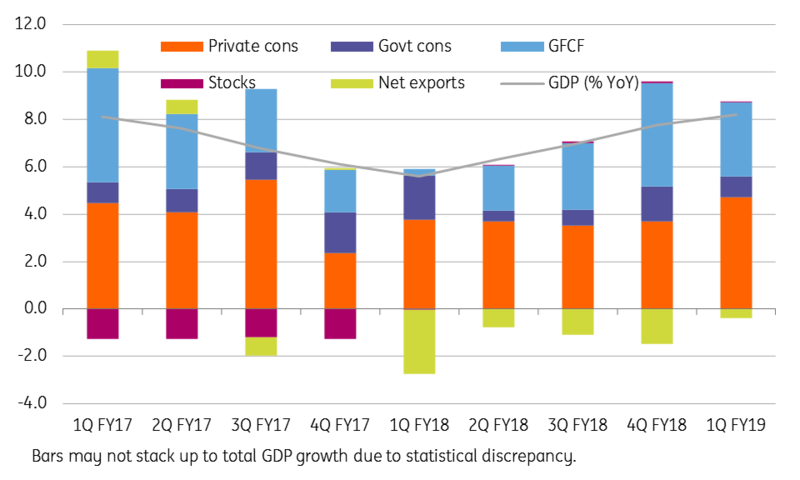 We think two key questions the latest data pose are: Will strong GDP growth help to stimulate foreign investors’ confidence in the Indian economy and halt a free-fall of the INR? And, will this also open the door for more aggressive RBI policy tightening to stem the currency weakness and keep inflation in check? We are skeptical of the first; INR isn’t quite out of trouble from adverse domestic economic factors, let alone external contagion. But we are hopeful about the second. We maintain our view of the RBI hiking rates again at the next scheduled meeting in early October, possibly a double-up (50 basis point) hike or even an inter-meeting hike if the ongoing external contagion drags the currency for even more depreciation. That said, we continue to see more upside than downside risk to our USD/INR 71.5 end-year forecast. But for today, we can expect some knee-jerk strengthening of the currency, as markets had no chance to respond to the data released after the close of trading on Friday.